Margaret Eleanor Atwood. Born November 18, 1939 in Ottawa, Canada. Although she did not attend school full-time until Grade 8 (due primarily to her father's research in the field of forest entomology in the woods of Northern Quebec), she began writing at the age of six. By sixteen, she knew that she wanted to be a writer. In 1961 she earned a B.A. from Victoria College in the University of Toronto in English with minors in philosophy and French. While in college she published poems and articles in the college literary journal. Later (1962) she obtained an M.A. from Harvard's Radcliffe College after receiving the Woodrow Wilson Fellowship. She began studies at Harvard University after that but never completed her dissertation. 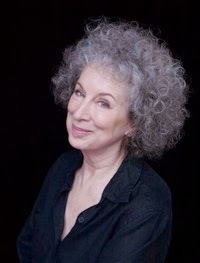 Since 1965 Atwood has taught at numerous universities throughout Canada and the United States. At 74, Atwood is one of the most tech-savvy authors around. Her Twitter account has over 470,000 followers and she uses it on a regular basis. She's a Goodreads author and is currently working on a serial novel (kind of like The Green Mile by Stephen King) that's being published only in eBook format. To date, she's written 14 novels, 10 short story collections, 20 volumes of poetry, 7 children's books, 10 non-fiction books. Additionally, she has written television scripts and librettos. Her awards are too numerous to mention, but she's been short-listed for the Booker Prize five times and won in 2000 for The Blind Assassin. Far and away, she's best known for her novels. Let's talk about them! Atwood's best known novel is probably The Handmaid's Tale. In my own observation it seems to bounce back and forth between required reading for high school students to the banned books list, she's probably making a fortune from school libraries continually having to re-buy it. That's okay. I love that book, and indeed it was my first introduction to Atwood. What's this seminal piece of literature about? It's the story of a near-future dystopia, ravaged by toxins causing the birthrate (and number of fertile women) to plunge. A fanatical, repressive theocracy forces those fertile women into childbearing against their will and forces all women into a terrible caste system. It's a fabulous piece of dystopian literature and was my very first Margaret Atwood. So, I once had a friend looking for a new book to read, I said "ZOMG. Go get a Margaret Atwood!" He responded, "I'm not really into feminist literature." This is a common misperception about Atwood, while she most definitely writes some literature with heavily feminist undertones (Surfacing, The Handmaid's Tale, and The Penelopiad, to name a few) she's written a great deal on other issues as well. The MaddAddam Trilogy is a magnificent work of speculative fiction concerning itself with science outpacing man's morality, the rise of the corporation state, and environmentalism. Atwood owns the genre of speculative fiction and definitely shouldn't be discounted as 'merely' a feminist author. This article is far from comprehensive on the wonderful, magnificent, amazing Margaret Atwood. I hope this inspires you pick up something if you've never read her or read more if you have, I think I'm going to go out and get one of her poetry collections myself! Margaret Atwood's scope is vast and deep. She's a magnificent writer and there is truly something for everyone. Don't believe me? Book Riot made a convenient, easy to use flowchart! Pick your poison and start today! So Readers, what's your favorite piece by Margaret Atwood? Are there other female writers that you love? Thanks to April from The Steadfast Reader for guest posting today! My theee all-time favorite Atwood books are The Handmaid's Tale, Cat's Eye, and The Edible Woman. Other favorite woman authors: Toni Morrison, Joyce Carol Oates, Barbara Kingsolver, Maya Angelou, Zora Neale Hurston. Janet Fitch! Yes! I adore White Oleander. SO GOOD. I hadn't heard of 'The Bees', but it sounds fabulous. Heather, have you read Paint it Black by Fitch? I liked it. It's not as great as WO but it's set a lot in Paris and I'm a sucker for that. April, I very rarely drink coffee and when I do it is for a latte so idk if that even counts. I love Earl Grey with Raw Sugar & splash of milk or green tea with honey. What about you? Oh yes. I forgot Cather. I took a class in college that was Henry James/ Willa Cather. I struggled through a half semester of James just so I could study Cather. So much symbolism. I have only read The Penelopiad and Cat's Eye but I have The Handmaid's Tale on my Classics Club list. Even only having read those two, I still have a massive girl crush on Atwood which has just been further encouraged now I've found out all that about her life! Y'know, I'm not sure that I've actually read 'Cat's Eye'. I've read 'Cat's Cradle' by Vonnegut - which is totally different, of course. I guess I'm going to have to check out 'Cat's Eye'. I admit that I have yet to read an Atwood book. But I say "yet" because I do have ALIAS GRACE at home in my to-read pile. I've only read The Handmaid's Tale, which I loved, so I'm totally bookmarking this post. Fantastic primer, April! I loooooooooove Atwood! The Handmaid's Tale is probably my fave, but the MaddAddam trilogy was so amazing. Seriously, she KILLS a dystopia. My fave non-dystopian Atwood is Cat's Eye. So many good ones to choose from though! The Blind Assassin has been on my bookshelf for years. I need to dust this one off and get started. Great article! I read my first book written by her this March - "The Handmaid's Tale" and after finishing it, I want to read more of her books. I think I'm going to try the first book of the MaddAddam trilogy next. Do it! I love the MaddAddam trilogy!